Home » Chaparral 2018’s – Special Savings! Chaparral 2018’s – Special Savings! Save now on all remaining 2018’s from Chaparral and Pier 33. Take advantage of special discounts while they last! These new boats are showroom-kept and carry full warranty from Chaparral and Mercury, but we do need to make room for arriving 2019’s. Special pricing is not published on-line, you must contact a Pier 33 Chaparral Specialist: (269) 983-3333. All sales are F.O.B. St. Joseph, MI – Pier 33 does not export or drop ship. Get aboard with Pier 33 for your on-water orientation. 2017 Chaparral 203 Vortex VRX. Jet! 250 HP. Blue VRX Package. Trailer. Was $48,674. 2018 Chaparral 21 h2O. Mercury 4.,3 MPI, 220 HP. electric Blue with Black Hull Bottom. Trailer. Was $40,219. 2018 Chaparral 223 Vortex VRX. Four remaining: Fire Red, Stealth, Lime Green, Deepwater Blue. Twin 200 HP Jet. Trailer. Was $67,554. 2018 Chaparral 257 SSX. Mercury 6.2L DTS, 350 HP. Eclipse Blue with Custom Red Stripe. MSRP $138,006. 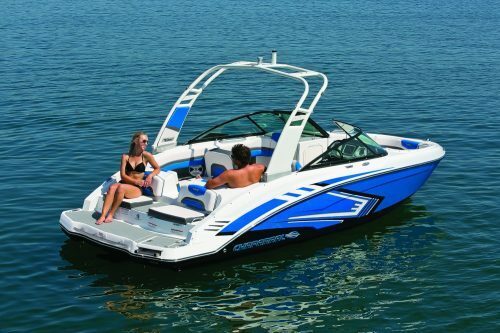 2018 Chaparral 267 SSX. Mercury 6.2L DTS 350 HP. Eclipse Black with Custom Blue Stripe. Demo. MSRP $147,192. 2018 Chaparral 270 Signature. Mercury 6.2L 350 HP. Air, Camper, Arch. Biscayne Blue. MSRP $157,814. 2018 Chaparral 287 SSX. Mercury 8.2L HO DTS 430 HP. Electric Arch, Dual Garmin, WIndlass. Eclipse Blue with Custom Silver Stripe. MSRP $183,725. And, for a limited time, earn a Bonus Cash reward from Chaparral on any of these 2018’s!